INVESTOR SPECIAL! HOUSE WAS PARTLY DAMAGED BY FIRE. RESTRICTED ENTRY AS IT COULD BE SAFETY HAZARD. ENCLOSED PORCH. POSSIBLE PRESENCE OF LEAD BASE PAINT DUE TO AGE OF HOUSE. CAPE COD STYLE WITH 3BRS/1BTH, WHEN REHABILITATED COULD BE A CHARMING HOUSE. 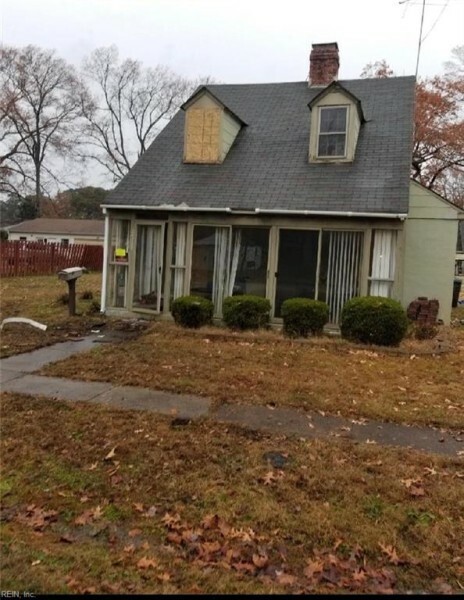 REHAB LOAN OR CASH DEAL ONLY. LARGE WIDE LOT WITH DETACHED 2-CAR GARAGE AND MULTIPLE SPACE FOR PARKING ON THE LOT. PLS CALL LISTING AGENT FOR SPECIFIC INFO ABOUT PROPERTY. Ready to visit 2 Magruder? Request a free property tour! Send me more information about the listing at 2 Magruder, Newport News, VA 23605, MLS# 10239857. This 3 bedroom, 1 bathroom home located at 2 Magruder, Newport News, VA 23605 has approximately 843 square feet. It is currently listed for $55,000 and has a price per sqft of $6,524. This home is currently Sold under the MLS#: 10239857. This listing is provided by Southern Realty Inc..
2 Magruder Road, Newport News was built in 1940. It has Garage Det 2 Car, Oversized Gar, Lot parking.The kitchen includes None. 2 Magruder is part of the All Others Area 107 neighborhood located in 23605.